I had to make another Sympathy card for one of my Husbands co-workers. I used the Urban Garden DSP and Kiwi Kiss Corduroy brads and button. 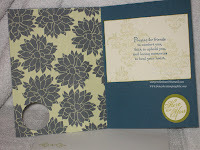 The card stock colors are Kiwi Kiss, Not Quite Navy, and Very Vanilla. The stamp set I used, Friends 24-7, is very versatile. I love the calmness of the images. 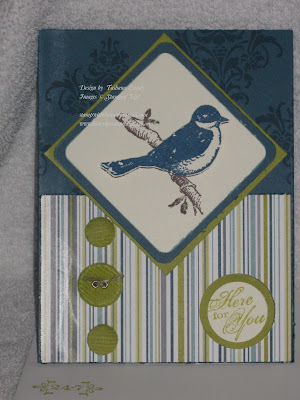 I punched out the sentiment with the 1" circle punch and layered on a 1-1/4 circle. It is popped up using dimensionals. The sentiment on the inside is from the stamp set Thoughts & Prayers.